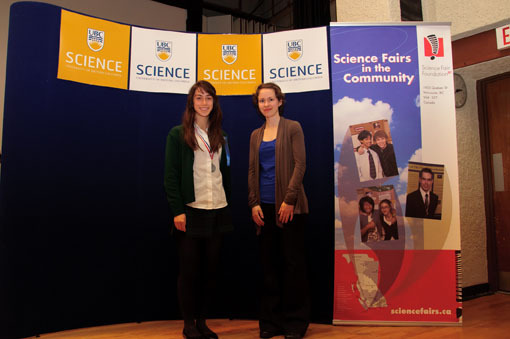 YHS participated in the 2011 Greater Vancouver Regional Science Fair (GVRSF) with two project entries. The first project was by Marissa and Sabiha (Grade 8), and the second one was by Isabella (Grade 10). 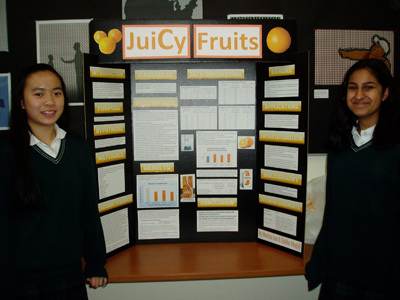 Marissa and Sabiha’s joint project tested the levels of vitamin C in freshly squeezed orange juice, not from concentrate. At the end of the three-day session, Marissa and Sabiha were recognized with a participant award. Isabella commented that the GVRSF and the SABC Competition were wonderful and enriching opportunities to pursue and research a question in a real laboratory as well as share what she had learned with other people. She mentioned that the SABC, in particular, was one of the most challenging and great experiences she has had so far, especially, because she got the opportunity to present her research in front of an audience for the first time.